My image of Dubai was one of superlatives. I heard about the hotel where the least expensive accommodation is $1000 a night. I know they are building Burj Dubai which will be over a half mile high when completed plus they are creating several extensive island complexes. One complex of 300 islands that resembles a map of the world will be 5.4 miles by 3.6 miles with marine or air transport the only way to get around. 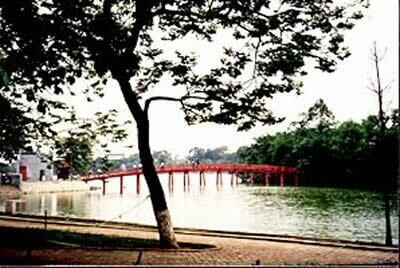 I wanted to see for myself this place that seems audacious in the extreme. But could I afford it? When I found Holiday Inn Express and Ibis Hotels for under $125 I decided to go. The Jumeirah Mosque, the only mosque open to non-Moslems, offers a tour called “Open Doors, Open Minds.” For $3 the tour gives an insight into the Islamic religion including an explanation of the basic tenets. Two English ladies who have lived in Dubai for 17 years served as guides. They explained the cleansing process before prayers, the Five Pillars of Islam, and that the choice of clothing is more cultural than religious as the Koran only states that clothing should be modest. Interestingly, I noticed that bling has come to the abaya, the coat-like covering worn by women. At the end of the tour questions were welcomed. Dubai’s museums are excellent and reasonable with most charging about $2 for admission. When I entered the Dubai Museum I thought the courtyard, which was set up like a typical home of 50 years ago, was the entire museum. I followed the arrows that I assumed led directly to the exit and was amazed to enter the large air-conditioned underground exhibit area with multi-media presentations that records Dubai’s development from the early pearl divers to the discovery of oil in the late 1960s to the current over-the-top developments. One of my favorite evenings was also the least expensive. 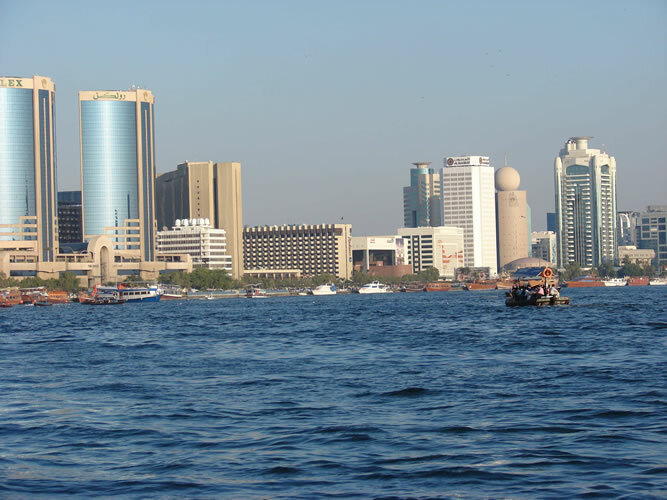 I wandered through the Deira spice souk that is filled with wonderful aromas of frankincense and myrrh, took the shuttle ferry across Dubai Creek, and strolled down the corniche to the Heritage and Diving Village. Along the way I toured the Sheikh Saeed Al Maktoum's House, once the home of the grandfather of the present ruler and one of the oldest residences in the city. Of special interest in the Maktoum House were the wind towers constructed to keep their homes cool. Wet cloths were hung in the towers and when the wind blew it caused evaporation – a cooling process that worked like an air conditioner. At the Heritage Village there were school children performing traditional dances, Arabian horses, camel rides, craftspeople, and ladies cooking traditional treats. Admission to the Heritage Village was free so including the ferry ride, food, and admission to Maktoum House, I spent about $5. The best part was it gave me a feel for the real Dubai as there were many local families spending a relaxing evening at the village. 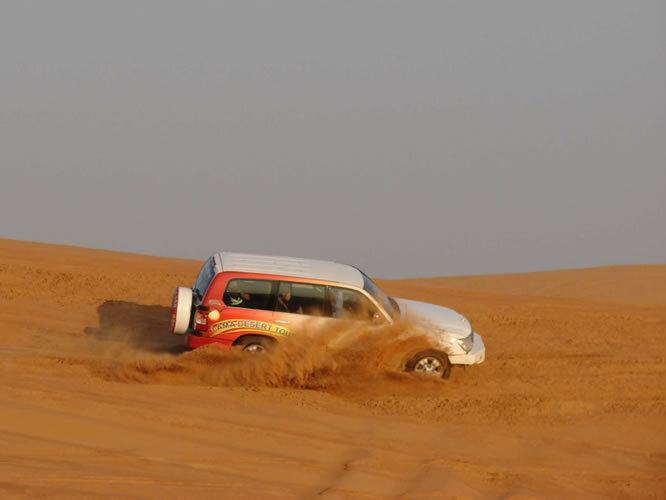 Late one afternoon I went dune bashing ($75) in a Toyota Land Cruiser – a must-do in Dubai. With seat belts buckled, some air let out of the tires to make it run better over the sand, my driver took off charging up one dune and careening down another arriving at the top of a dune, along with scores of other vehicles, in time to watch sunset. Then it was off to a desert camp for a camel ride, a belly dancing show, and a traditional BBQ buffet. Dubai is a shopaholic’s dream with traditional souks and glitzy malls offering everything from antiques to designer clothing to gold. 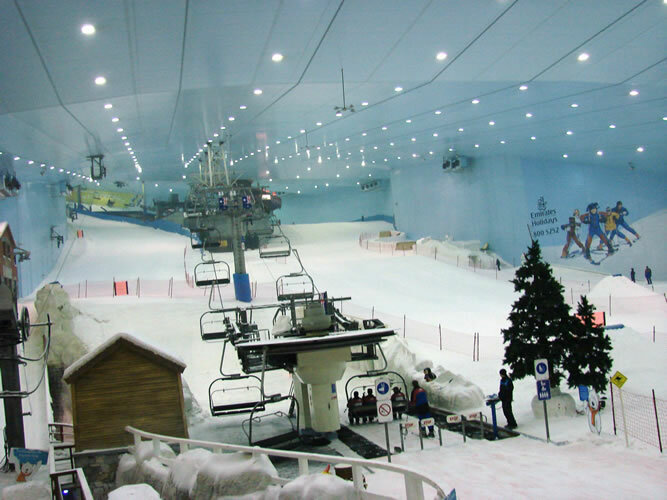 My reason for visiting the Mall of the Emirates was to see Ski Dubai, another audacious project. I could have sat on a bench in a lobby area of the mall and watched the activity for free but I opted for the $20 admission ticket that included winter attire, tobogganing and tubing, but no skiing. A chair lift provides access to the three ski runs - one is almost a quarter of a mile run. Truly amazing. Watching people, young and old, experiencing cold and snow for the first time was great fun. Dubai has several beachside resorts including the world famous Burj Al Arab and the Atlantis hotels. Both were out of my price range, however there are public beaches with free access. Combining my desire to stay at a resort plus visiting some of the other six emirates, I booked a room at Sandy Beach Resort in Fujairah. On the way I spent a night at the Holiday Inn in Sharjah, which is just across the creek from Dubai. 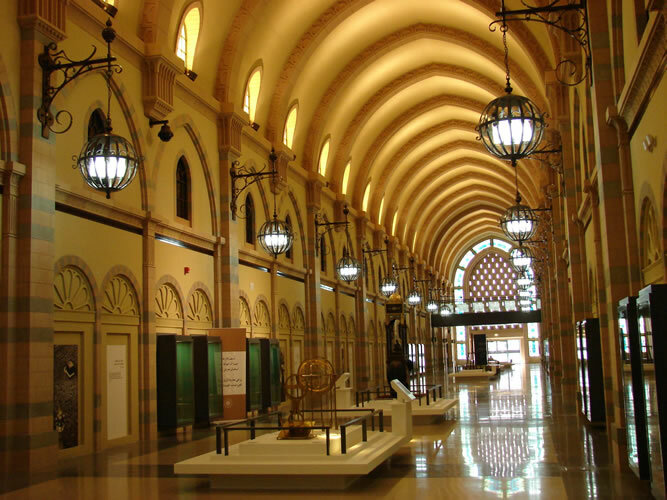 The emirate of Sharjah has a beautiful corniche, an excellent heritage village but I most enjoyed the Museum of Islamic Civilization, which deals with many of the scientific advances attributed to the Arab heritage. Also interesting was the display of stylish clothes that can be worn by females when swimming and participating in sports while still remaining covered. 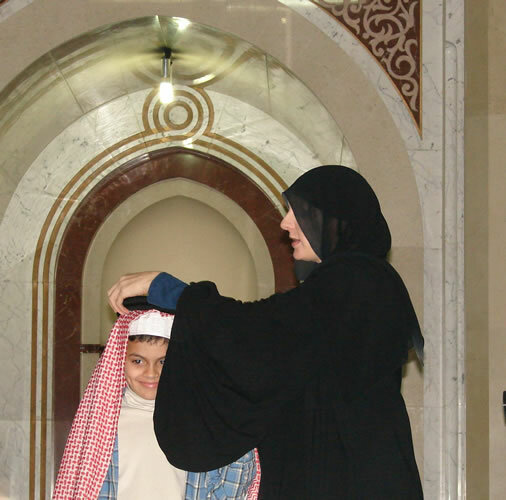 Sharjah keeps more closely to the Islamic traditions and is known as the “dry” emirate. At Sandy Beach Resort in Fujairah, the only emirate on the Gulf of Oman, I relished my days of rest and relaxation. Just a short distance off shore from the beach is a rock formation called “Snoopy Island” because it resembles a relining Snoopy. It is a great place for snorkeling. The resort has many cottages where local families arrived on the weekend to enjoy the beach and cook BBQ. It was another insight into the everyday life of the people, which is really hard to see in Dubai. On the one-hour trip back to Dubai I stopped at a scenic overlook with the desert spread out in every direction. It bought home the fact that it was only 50 years ago when the emirates were mostly desert, which makes the Dubai of today even more impressive. The infrastructure is excellent with Dubai’s new metro scheduled to open in September. Dubai is tourist friendly with every possible vacation activity imaginable from deep sea fishing to visiting conservation areas to dhow dinner cruise. With their oil reserves nearly depleted Dubai’s economic focus has turned to tourism. It would be fun to return to see their new audacious projects including Dubailand destined to be the world’s largest multi-themed entertainment attraction when it is completed in 2020.